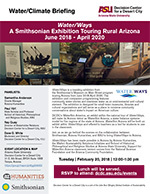 Water/Ways is a traveling exhibition from the Smithsonian’s Museum on Main Street program touring Arizona from June 2018-April 2020. The exhibition and companion programming features community water stories and examines water as an environmental and cultural element. The exhibition is designed for small-town museums, libraries and cultural organizations and will serve as a place to convene community conversations about water’s impact on American culture. DCDC’s WaterSim America, an exhibit within the national tour of Water/Ways, will make its Arizona debut as WaterSim Arizona, a water balance systems model for five regions of the state of Arizona. WaterSim Arizona will be both an exhibit within Water/Ways and offered to teachers as a tool for students to use in the classroom. Join us as we go behind the scenes on the collaboration between Smithsonian, Arizona Humanities, and ASU to bring Water/Ways to Arizona. 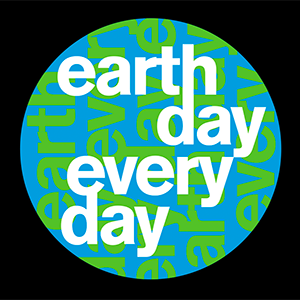 Water/Ways has been made possible in Arizona by Arizona Humanities, the Walton Sustainability Solutions Initiatives and School of Historical, Philosophical and Religious Studies at Arizona State University. Support for WaterSim Arizona classroom version comes from the National Science Foundation and the Arizona Community Foundation.